Who says you have to know right at this moment what you want to do for the rest of your life? We don’t. At Hanover you’re in charge of your own path. You can change your mind along the way as your interests evolve, and still graduate within the traditional four-year period, ready for your career. Maybe you want to combine your love for cooking with computer science and create an app that helps mission workers teach villagers how to cook foods rich in protein? Perhaps you want to write a screenplay that advocates wildlife preservation – in three languages. At Hanover, you can do all of that as an undergrad. With endless possibilities, you can chart your own path for career prep within our 33 majors or through our design-your-own option. And, when you take advantage of our internships, you’ll be ready for anything. Our strong financial aid is designed to make a private college education affordable. Why should I study at a private college? What are the campus living options? At Hanover, we don’t think anything should hold you back from going where you want to go to school or where you want to go in life. Especially money. That’s why we offer three different types of aid packages to 98 percent of our students. For the 2017-18 year, we gave more than $52 million in aid. And, with a monthly payment plan option, you can pay as you go. You didn’t learn to ride a bicycle by reading about it or watching a video on YouTube, did you? At Hanover, we don’t think you should learn about your career that way either. We offer real experiences to learn while doing. Our Business Scholars Program allows you to earn some career experience, while you earn a paycheck at a regional organization or company. It combines practical knowledge with practical application — in real time. The Health and Biomedical Sciences Program lets you perform real medical technique on real cadavers, before graduate school, and Hanover is the only school in Indiana where you can do that. There’s an expression that says “love what you do and you’ll feel as though you’ve never worked a day in your life.” At Hanover, we couldn’t agree more. When you get to try out your career before you have to fully commit to it, you can refine what’s important to you and figure out what you enjoy doing. Hanover’s career preparation matched with a solid liberal arts approach helps our grads find immediate success. Ninety-eight percent find employment or enter grad school in the first seven months following graduation. These services and more are available from the Levett Career Center. Brains before beauty? Beauty before brains? How about both? 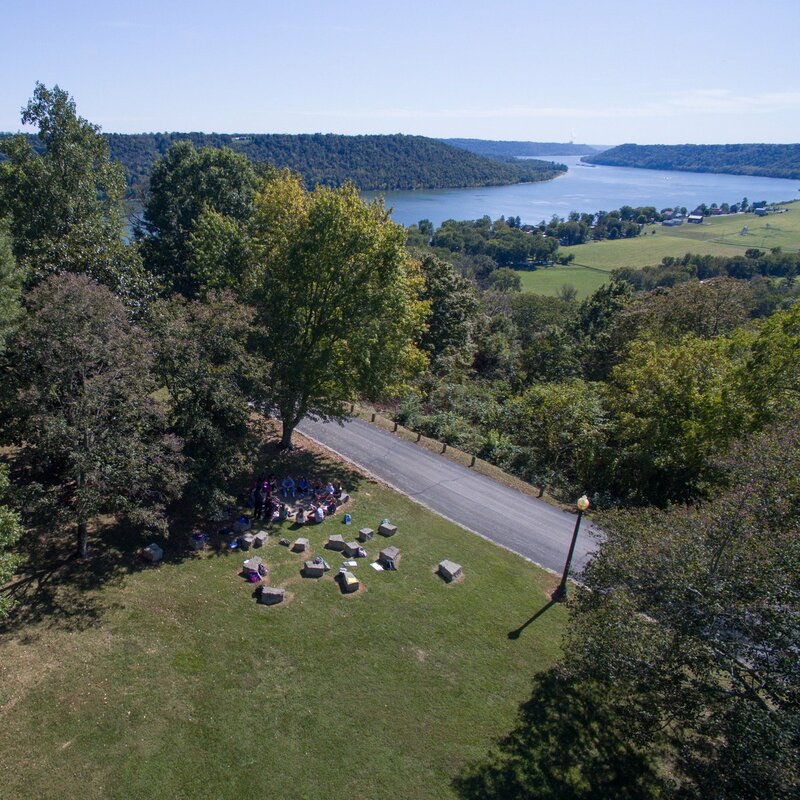 Overlooking the scenic Ohio River, we challenge you to find a campus as stunning as Hanover. There’s no stopping your creativity and your ability to think when your senses come alive. With four hiking trails on campus, and more than 650 acres of lush grass-covered land where you can spread out with your laptop and a cup of coffee or throw around a Frisbee, your senses will be enlightened. No wonder The Princeton Review just named us "One of the 20 most beautiful college campuses." Learn more about our stunning campus. When you’re excited by something, you want to do it exclusively, right? With our May Term, you can. Immerse yourself in that specialized topic by focusing intensely on one experiential class each year. You can do this in whatever location makes the most sense to give you the most authentic experience. Even halfway around the world. Learn more about May Term. Do you remember how intrigued you were thinking about what your grade school teacher’s home looked like or what kind of pets she might have had? 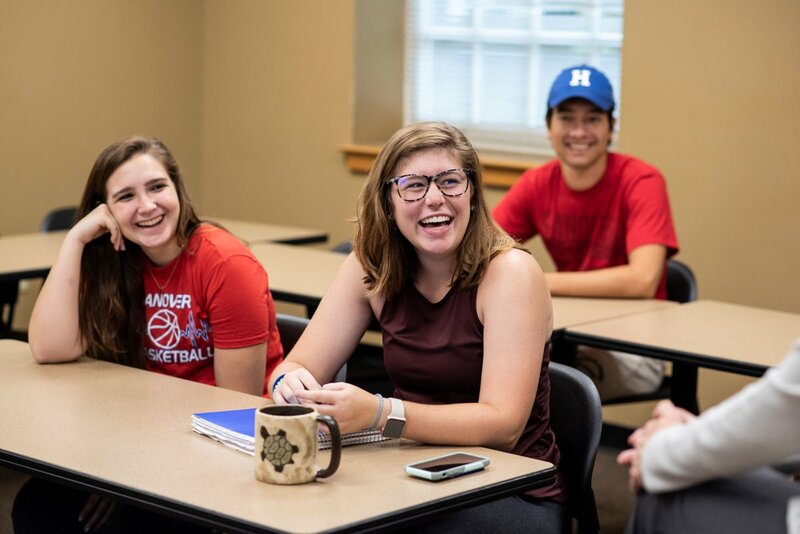 At Hanover, college is all about personal relationships. Faculty members are eager to share their experiences with you. From special gatherings hosted at our president’s home to studying for finals at a class BBQ in their backyard, our students and professors are more like family. In fact, one-third of our faculty and staff actually live on campus. Families sometimes worry when they hear the term private college. They might automatically equate that to higher tuition costs or perceive that only certain kinds of students are accepted. Sometimes these myths cause them to immediately cross private schools off their list. In actuality, private colleges offer students smaller class sizes, greater personalization where each student is individually nurtured and opportunities for students to customize their education to fit their specific needs. At Hanover specifically, 98 percent of students get a job or pursue graduate school shortly after graduation. "What I gained from Cuba was knowledge, love, and understanding. Cuba was an enlightening experience, a mark off of the bucket list, and insight into the life and feelings of Hemingway, Errol Flynn, Dezi Arnez, and all the visitors that have been enchanted and entranced by the Pearl of Antilles!" Most people don't realize how affordable a private school education can be. Our counselors make every effort to meet your unique financial needs. 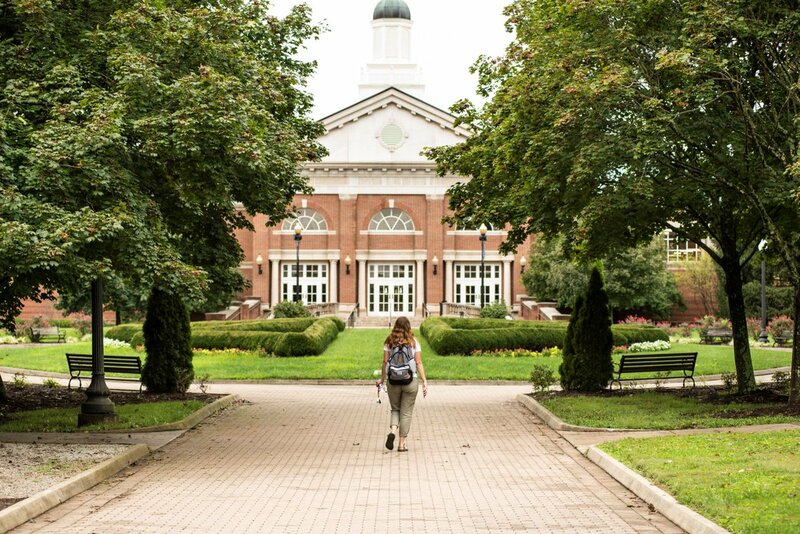 At Hanover, we want to overwhelm you with opportunities, not with the application process. Simply put, we’re looking for students who want a unique experience, designed just for them and who want to make a difference in the world. It’s not often that you would buy a new pair of shoes or clothing without trying it on, is it? After all, those items are a big investment, a symbol of who you are, and you don’t know at first whether or not they really fit. It's the same with college, and we encourage you to come check us out before making such a huge commitment. A typical visit includes a walking tour and an interview, but there are plenty of additional ways for you to customize your experience. Arrange to observe a class, speak with a certain professor or talk with one of our social club chairs. You can even spend the night. Our counselors serve geographic areas all over the country; select your home state to find out who your contact is. APO & Homeschoolers: Your counselor is Jane Stormer. If you live outside the U.S., find out more information for international students. If you don't have a counselor assigned to your location or have a general question, please email admission@hanover.edu.